A Code of Conduct is a set of rules outlining the responsibilities of or proper practices for an individual or entity. Metro has Codes of Conduct for its Board of Directors, contractors, and employees. The codes of conduct were adopted by the Board as part of our Administrative Code, a Metro ordinance. The Board Code of Conduct is also enacted as a state statute. Metro has also adopted a Customer Code of Conduct that took effect July 1, 2011. The Ethics Department is charged with interpretation and maintenance of the codes of conduct. Violations of a code of conduct can lead to sanctions and in some cases termination of employment or contracts. 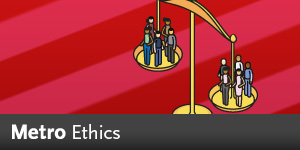 If you have any questions about whether your conduct is permissible under a code of conduct, you are urged to contact the Ethics Department before you act. If you are aware of any possible violations of the codes of conduct, these should be reported to the Ethics Department.